Michelle Rodriguez reported to the Kaneohe District Courthouse yesterday afternoon where she was taken into custody to serve four days in jail for her DUI conviction. "LOST" television star Michelle Rodriguez opted for a few days in jail yesterday rather than 240 hours of community service after pleading guilty to driving while intoxicated in Kailua last year. Kaneohe District Judge James Dannenberg gave the Hollywood actress the option yesterday morning after she made her plea. He sentenced her to five days in jail, but she got credit for one day for the time she served after her arrest. "I personally am thankful that I was stopped because of the fact that I didn't acknowledge my own behavior and how sporadic it was until all hell broke loose in my life." Rodriguez, 27, surrendered to authorities in the afternoon to begin serving her four days at Oahu Community Correctional Center. During the Dec. 1 arrest on Kalanianaole Highway, Rodriguez screamed and yelled at officers. She had to be carried into the Kailua police station because she sat down in the station garage and refused to stand up, according to a police source. In court, Rodriguez apologized for her behavior but also blamed it on steroid injections she had been taking twice a month to treat allergies to "dust and cockroach resin" which began when she arrived in Hawaii last year. She said the effects of the steroids made her "manic," kept her up late at night and caused her to have "menstrual cycles three times" a month. "I wasn't right in my head," she said in court. "None of that verbal behavior was directed towards them. It was directed towards myself." Wearing a leather jacket, white ankle-length skirt and slippers, Rodriguez smiled as she passed reporters outside and held that smile while in morning court. Michelle Rodriguez of the TV series "Lost" entered Kaneohe District Courthouse yesterday afternoon where state sheriffs were waiting to take her to jail. About her arrest, she said, "I personally am thankful that I was stopped because of the fact that I didn't acknowledge my own behavior and how sporadic it was until all hell broke loose in my life." Rodriguez and fellow "Lost" actress Cynthia Watros were arrested separately for operating motor vehicles while under the influence of an intoxicant just after midnight on Dec. 1. The two of them began to "weave all over the right lane and into the bicycle lane," according to police reports. Police said Rodriguez, who had been driving a black Mercedes sedan, had a blood-alcohol level of 0.145 percent while Watros, who was driving a white Lexus sport utility vehicle, had a 0.1 percent blood-alcohol level -- both above the state's legal limit of 0.08 percent. Watros, 37, who plays Libby, pleaded guilty to drunken driving in January and was fined $312, ordered to undergo an alcohol assessment and 14 hours of counseling. She also had her license suspended for 90 days. Michelle Rodriguez scrunches up her face yesterday in court as she reviews some papers with attorney Steven Barta. Prosecutors noted that this is Rodriguez's second drunken driving conviction. The first one was in California, where she pleaded no contest in June 2004. She also faced charges of leaving the scene of an accident and driving without a license. Deputy Prosecutor Sean Sanada said Rodriguez had three speeding tickets on Oahu in the months prior to being pulled over for drunken driving, including one for 90 mph in a 35-mph zone. He said she should face the maximum sentence of 14 days in jail and a $1,500 fine. "We're very disappointed in the sentence that was imposed," said Sanada. "We weren't treating her differently than we would treat any other person. "Drunk driving is a serious offense and when you couple that with Ms. Rodriguez's record, any person similarly situated would receive a similar sentence." In court, Rodriguez asked the judge to take into consideration that she only got her driver's license seven years ago so she could do a "car racing movie" and that "all of my driving experience started and was acquired from car racing school." 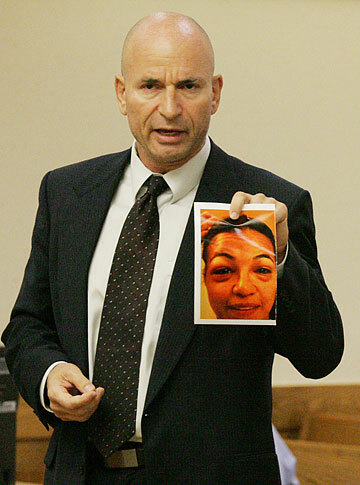 Rodriquez's attorney Steven Barta shows a photo of Rodriguez while she was under treatment for allergies. "I've only been driving since I was 21, that's six years of driving," she said. "For the most part it's been on the track or in a sports car." Exactly how Rodriguez's guilty plea will affect her probation status in California is unknown. Fans of Rodriguez and of the hit show "Lost" have fueled rumors on numerous Web sites such as the "Michelle Rodriguez Underground Forum" that her character, "Ana Lucia," would be killed off because directors were afraid she would have to serve jail time. Sources confirmed this week that Rodriguez's character would be killed off and that in fact her death scene has already been filmed. Rodriguez would not confirm or deny Ana Lucia's fate yesterday, saying: "Why don't you watch the show and find out for yourself?" During her testimony yesterday, Rodriguez talked about the many circumstances leading to her DUI arrest last year. "(My) employment on 'Lost' was decided a year ago before I signed on," she added. Rodriguez said she's "lost everything" because of her drunken driving arrest and had to sell her house and car to help pay for legal costs. In court, she referred to her attorney, Steven Barta, and said, "I've already spent $50,000 on my lovely lawyer here, and you've been great by the way." As to why she opted for jail time instead of community service, she said, "I kind of have to go back to my life, go back to making some money. "This sort of gave me a hard hit." Michelle Rodriguez talks to press about her DUI arrest last year after pleading guilty in court yesterday. Rodriguez enters the courtroom were State of Hawaii Sheriffs were waiting to take her to jail. "Lost" star Michelle Rodriguez reported to the Kaneohe District Courthouse at 2pm to be taken into custody to serve a five-day jail sentence for her DUI conviction.